This page received over 34,000 visitors before the 2004 election. If it helped inform one voter (through our links and commentary) then we've done our job. The rest was just fun. Voting IS fun. 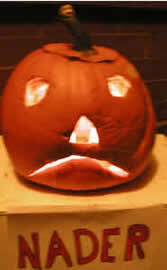 Though seeing one's selected candidate lose is not. Voting is your right and responsibility. Getting educated is fun too. Well sometimes it makes you mad. So what? Better to take control of your life and attempt to control our leaders than sit in the dark and wonder why someone else has one hand on your light switch with their other hand in your pocket. It baffles me that people admit that someone isn't doing a good job but are so afraid to try someone else. That's the part I don't understand. What if the challenger isn't ideal? Then in four years you boot him (her) out too. Back in elementary school I learned in Civics class that voting was not only my right, but my responsibility. When I mentioned that to someone recently they laughed. "Civics class? They haven't taught that in years." Now I see, schools are practicing "all children left behind". Besides reading writing and arithmetic, what could be more important. What difference does it make teaching what year this country was founded if we don't teach why. Well the results are in. 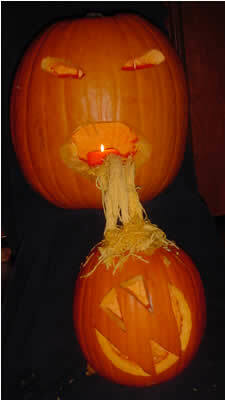 The voters have decided that these pumpkins all lost. Not exactly. 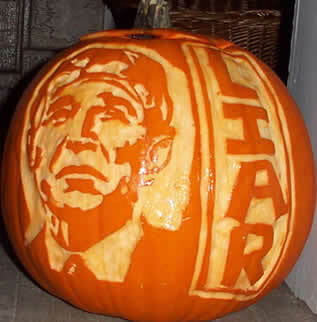 They still have four years to haunt President Bush's second term. 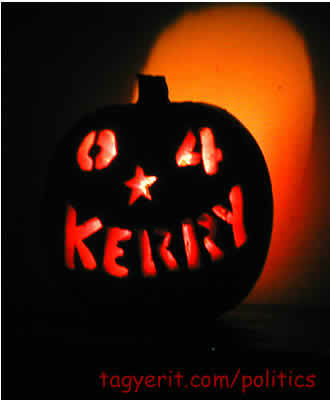 Maybe it was a bad sign when the "04 Kerry" pumpkin rotted on Halloween - 2 days before the election. Sigh! "Need A Ride" by Kathy Luttkus in Milwaukee. 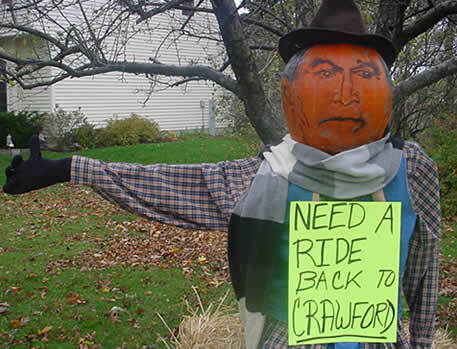 "When we first saw the George Bush pumpkin, he was eagerly waiting on the front lawn of a Milwaukee resident for a passer by to pick him up and take him back to friendlier territory. 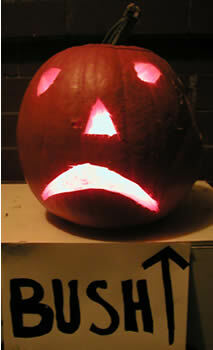 George was disheartened by polls citing low approval ratings in this “blue” state. Initially, he took pleasure in the local landscape while hitching his ride, admiring the geese that flew overhead and the stunning fall color. He would snicker and snort at the occasional bird that would perch on his outstretched arm, and the squirrels that would scamper below. 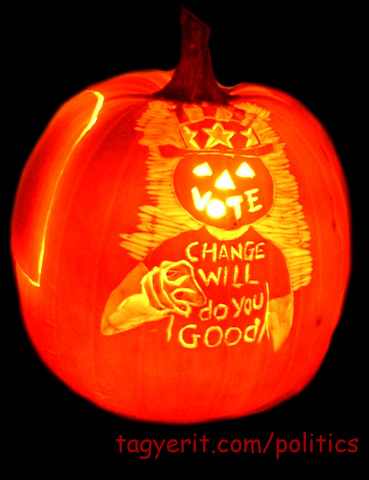 "The Great Pumpkin Ate My Vote" or "Now I Know What Happened to My Absentee Ballot". Veronica was one of the the thousands that requested a ballot back in August, again in September and didn't get it until the Saturday BEFORE the election. 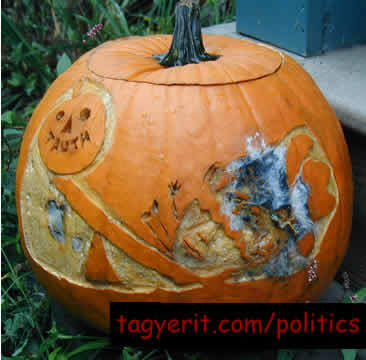 She used the envelope from that absentee ballot that should have been in her hands a month earlier and had the pumpkin do it's thing on it. As it happened she was back in time to vote but even so it took two hours of arguing and demanding a provisional ballot before she was allowed to vote. We're not ready to make a case for conspiracy theorists, but it's amazing that in this day and age, in the oldest democratic government, we still have a lot to fix. The news media is afraid to talk important issues. Instead they dance around silly minor themes such as 30 year old military records and unscientific vote-discouraging polls(4). 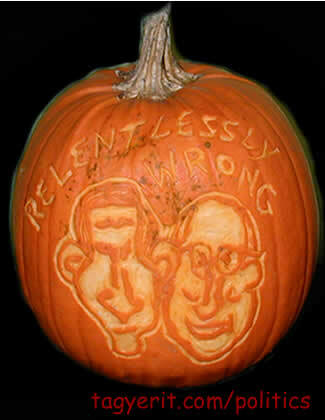 (Apparently they like to beat around the bush ) But let the pumpkins have their say and some real talking gets done. 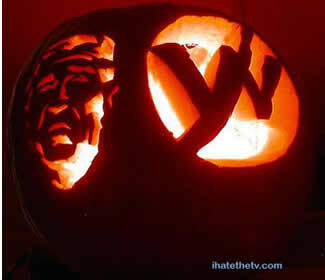 Watch out George W. Bush, the pumpkins are on the warpath. They do not want your oil wells in their fields, nor the smog blocking their sun, nor polluted waters in their roots. 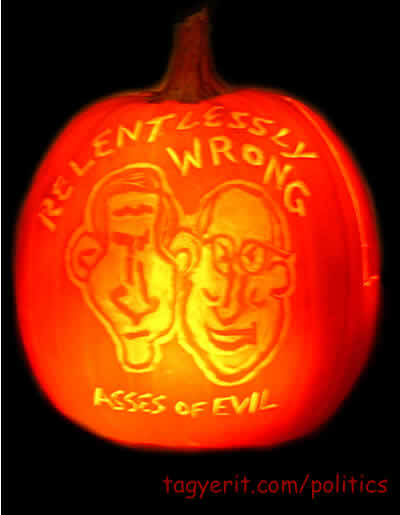 Email us about your ideas, your drawings, your pumpkin photos, videos, poems ... anything as long as it somehow uses pumpkins to help unseat the Bush regime. Then we'll explain where to email anything that requires an attachment. Try to keep them simple and funny. If you have that political cartooning knack, maybe someone will be inspired to email it to their friends. And that could be worth that crucial vote. Restored respect and cooperation in the international arena. Adrienne, who lives in a NYC co-op provided the following script for "The House of Horrors"
Make a sort of "tunnel" using black fabric. 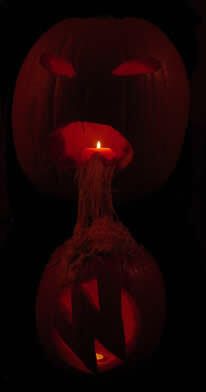 Pipe in spooky noise/music. From the entrance til about 1/2 way down the tunnel, put up signs that say things such as: "It's the scariest thing you've ever seen!!!" 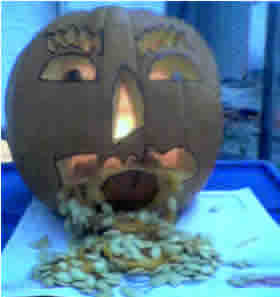 ... "Oh, the horror!!!" ... "Will you wake up from this nightmare?" etc. Then, fill the second half of the tunnel with images of Bush and accompanying comments about what will happen if he's re-elected. For instance: "Right wing appointments to the Supreme Court which will remain in effect for perhaps the next 30 years." "Crushing deficit" "Thousands more dead in Iraq" etc. 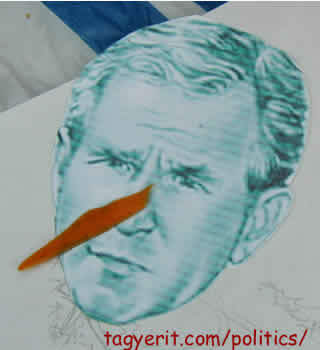 (At her website, she also has printable pages of anti-bush stickers). 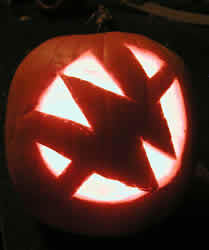 True Majority created the "No W" design to "Help Carve Bush Out of the White House" campaign. 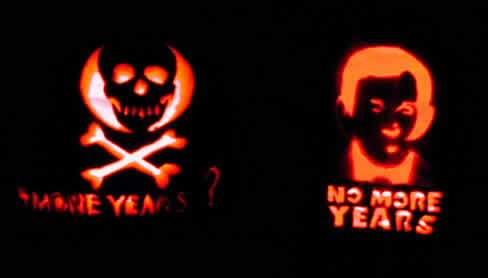 Vicki & her son John created these 2 to convey the life or death issue ahead. 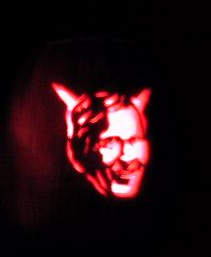 "Bush was the scariest theme we could think of." 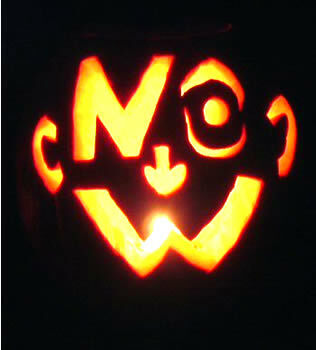 "Smoking George" was submitted by Brent Temple "No W Face" submitted by "Anonymous"
Carved by Shanna H. and friend "Smirking George" & "Vote" by Shanna H.
One of our contributors made use of 2 strategically placed pumpkins. She says she got lots of positive comments during trick or treating. Then she added. 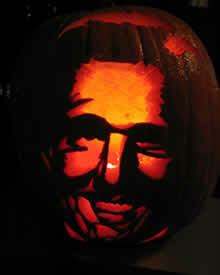 Kerry-O-Lantern by Sam Smith - On Halloween 2001 he decided to carve the two scariest things he could think of: George W. Bush and Osama bin. He made his own templates using photographs from google and modifying them in photoshop. 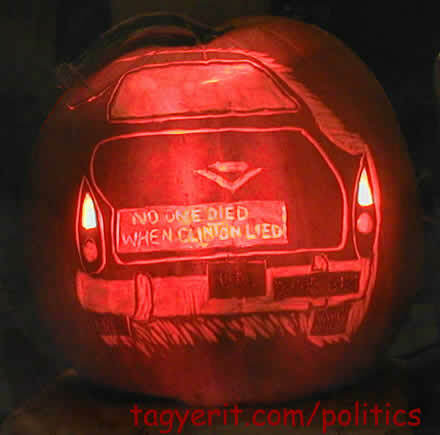 This year, as a freshman at Colorado College (a very pro-Kerry oasis in conservative Colorado Springs) he carved this pumpkin. 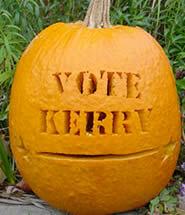 Not because he was scary, but as a different way to show hisKerry support. 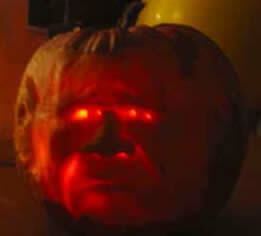 It is now lit day and night looking out over the quad (its a funkin, a plastic replica that won't decay. 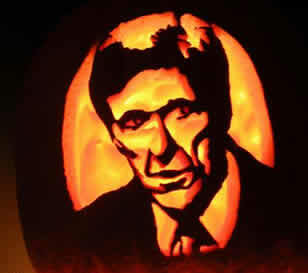 As Sam says, "I used to carve real pumpkins, but what's the point of showing Kerry support if it decays weeks before election day? 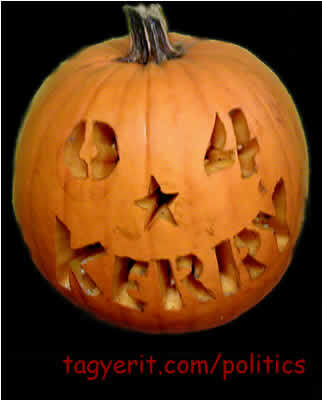 Click here to see the Kerry template as well as GWBush pumpkin. 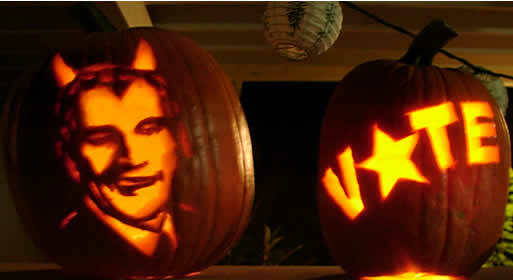 These stencils were created by Votestar. Make and prebake your pie shell. Make a shopping list of remaining ingredients. cream, whatever you have on hand). Throw in face of the next person who tells you he/she's voting for Bush. If you like these images. Please use them. If you edit the link out of the image, please include it in your site (article) along with credits (5) as appropriate. And then let us know. Steal a lot and they'll make you king"
When you're sliding down a hill, its easy to blame others and insist that its the right path. That you did it intentionally. Keep repeating your errors like a mantra and you'll have many people believing you. Until there's finally a realization that you were on the wrong hill all along. As the death count gets higher"
Fighting terrorism is no excuse for living in denial. If Saddam Hussein had really been a threat to the U.S., it just wouldn't have been so easy to defeat him. When Al Qaeda attacked the U.S. World Trade Center in NY, 2800 citizens died. Yes, Osama Bin Laden and Al Qaeda are still threats to the U.S., but in its blind response to fear, by attacking the wrong enemy, Iraq, over 1,000 U.S. citizens have already died and many billions of dollars have been spent. Instead of spending that money on protecting ourselves, the current administration is inadvertently doing Al Qaeda's job. I had originally thought I'd have Polly's T-shirt say "It will change your life". And I believe that's a great message. But when it came down to actually cutting out the letters, I decided having the word "good" there was a good thing. 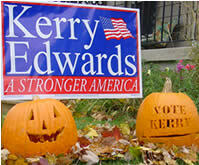 I can almost imagine everyone at John Kerry's campaign staff singing Cheryl Crow's "Change Will Do You Good". Unfortunately the rest of the lyrics in this song are not relevant. Oh well. Still the message is correct. In Taoist philosophy, change is recognized as the only constant. There's no excuse for not trying for something better. Hey if President Kerry were to screw up, we could always vote him out in 4 years too. Why John Kerry? If you think the press has covered John Kerry, you're mistaken. You'll be surprised to learn how conscientious and effective he really has been as Senator for the past 20 years. Where the Right Went Even More Wrong - a review of the book explaining where Buchanan has fallen short. John Eisenhower: Why I will vote for John Kerry for President - An article by the son of Dwight Eisenhower on why he gave up on the Republican party after GWB took office. 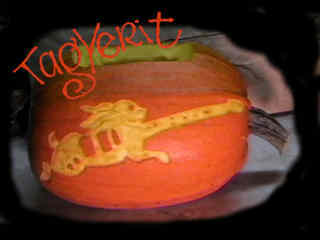 Pumpkin Expressionism A few items showing prior pumpkin political commentary. 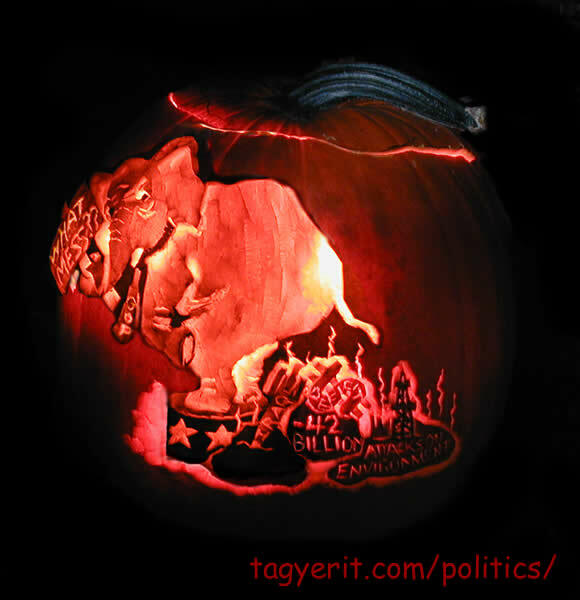 Are you wondering what the Bush team�s �October Surprise� will be? If they were to stage the capture of Osama bin Laden, who will play bin Laden? De Niro, Pacino, Robin Williams? Click here to check out the audition tape. "Need A Ride" by Kathy Luttkusin Milwaukee. 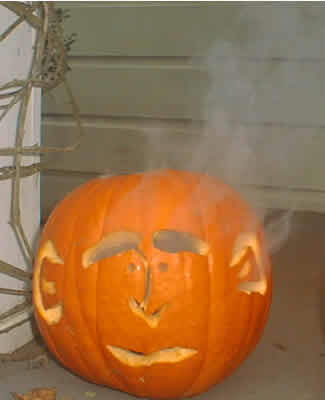 "Smirking George" by Shanna H.
If you like these images. please use them. If you edit the link out of the image, please include it in your site (article) along with credits as appropriate. And then let us know. (6) Letters signed by members of the right-wing think tank Project for a New American Century (PNAC) advocating invasion of Iraq. Note the signatures of those currently working in the Bush administration. Long before 9/11. We swear that we had nothing to do with this one. 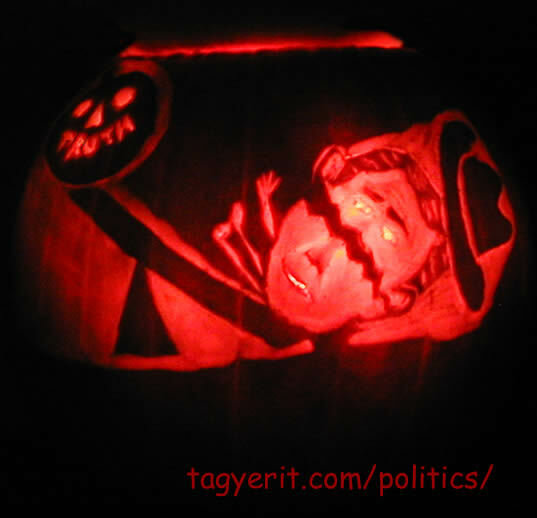 I had been carving the "Truth vs Bush on the SeeSaw" pumpkin. 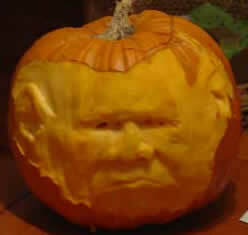 When I looked down I saw that Polly the Ticked-off Pumpkin had thrown this piece of pumpkin skin down on George W Bush's nose to look like Pinocchio. Keep checking back, there's bound to be more pictures as things progress. Ilana Wexler's "earliest campaigning began at 10 months, when her parents taped a Clinton poster on the back of her stroller ... in 1992. 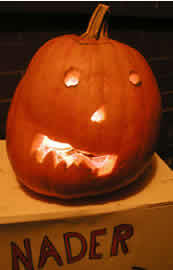 Though she accompanied her parents to a Halloween Clinton rally dressed as a pumpkin and to an antiwar protest in 2002, her real political consciousness materialized during a family trip to Latin America and Europe in spring 2003, when the family fielded questions about Iraq on both sides of the Atlantic and she saw graffiti that said "Americans, go home" while in Europe. .... She launched KidsForKerry.org and was asked by Heinz Kerry -- "Teresa" to Wexler -- to speak at a women's campaign event in February. Her March birthday party was covered by the local news as Wexler and 15 friends collected $1,000 for the campaign in less than four hours. Her chocolate birthday cake read, "A vote for Kerry is a vote for kids."